Memorial Day already? Believe it or not, many people consider this holiday the start of grilling season. But not this community. Most of us here at BarbecueBible.com have been grilling for months already—if not all year long. And given this winter—with its record snows and polar vortexes—that’s no small accomplishment. This Memorial Day, I’m building my family’s menu around dishes that have become near and dear to me over the past few years. You’ll find the recipes in my brand new book, Man Made Meals: The Essential Cookbook for Guys launched earlier this month. The fact is, most of these dishes have been Raichlen family favorites for decades. We start with a spicy twist on the ubiquitous hot dog—a dog that is really hot—thanks to a stuffing of fresh jalapeños (you leave the seeds in) and pepper jack cheese. The secret is to use a thick hot dog, like a knockwurst, so it can accommodate the filling. Slice it almost in half lengthwise to make a pocket, then tie the stuffed dog shut with butcher string, which holds in the stuffing in and looks cool as all get out. Don’t forget to butter the bun and toast it on the grill. Remember: perfection lies in attention to detail. 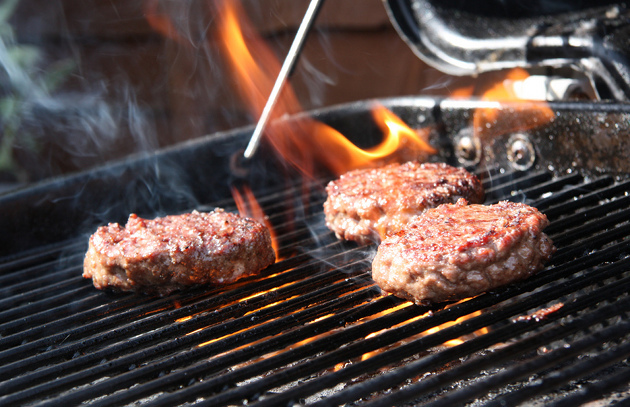 According to the HPBA (Hearth, Patio, and Barbecue Association), hamburgers are America’s favorite dish for Memorial Day. The Raichlen twist—the Inside-Out Cheeseburger—arose from a health challenge: how to grill a hamburger to a food-safe internal temperature of 160 degrees without drying it out like a hockey puck. The solution? Tuck a disk of blue cheese-flavored butter right into the meat. The cheese and butter melt as the burger grills, giving you the rich succulent mouth-feel of a rare hamburger. To reinforce the smoke flavor, you can substitute smoked gouda or provolone for the blue cheese butter. Our third dish takes us to South America (I can’t resist a little Planet Barbecue globe-trotting)—specifically, to Uruguay, which may be home to the world’s ultimate steak sandwich. If you think a Philly cheese steak has a lot going for it, wait until you bite into this jaw-stretching combination of steak, bacon, cheese, lettuce, tomato, and fried eggs. I dare you to eat more than one. To round out the menu, there is a smoked red, white, and blue potato salad and a smoke-roasted strawberry-rhubarb crisp for dessert. From all of us at Barbecuebible.com, happy Memorial Day! Let’s make it one hell of a grill season.